Sir George Martin CBE was The Beatles' producer, arranger and mentor, who signed them to EMI and worked on the vast majority of songs throughout their career. He went to a number of London schools as a child, including St Joseph's elementary in Highgate and St Ignatius College in Stamford Hill. When St Ignatius pupils were sent to Welwyn Garden City as evacuees during the war, the Martin family moved from London and George enrolled at Bromley Grammar School. During the war he worked briefly as a quantity surveyor and a clerk in the War Office, and in 1943 joined the Fleet Air Arm of the Royal Navy. He remained there until 1947, becoming a pilot and commissioned officer, though he didn't see combat during the war. Martin used his war veteran's grant to enrol at the Guildhall School of Music and Drama between 1947 and 1950, where he studied piano and oboe, and the music of Ravel, Rachmaninov, Cole Porter and Johnny Dankworth. Coincidentally, his oboe teacher was Margaret Asher; she was the mother of Jane Asher, who had a relationship with Paul McCartney in the 1960s. After graduating from Guildhall he worked at the BBC's classical music department, and in 1950 joined EMI as an assistant to Parlophone boss Oscar Preuss. At that time Parlophone, a German EMI imprint, was largely seen as a novelty label of little relevance. In 1962, using the pseudonym Ray Cathode, Martin released an electronic dance single called Time Beat, recorded at the BBC Radiophonic Workshop. Keen to capitalise on the burgeoning UK rock 'n' roll scene, he began looking for a group to work with. Martin was told about Brian Epstein, who was managing a pop group that had been turned down by the majority of labels including Decca. He arranged to meet Epstein on 13 February 1962, where he heard the Decca recordings, which he thought "unpromising". He did, however, think well of John Lennon and Paul McCartney's vocals. The pair met again on 9 May at Abbey Road, where they agreed a contract without Martin having met The Beatles or seen them perform. The contract, which he felt gave him "nothing to lose", promised The Beatles a royalty of one penny for each record sold. George Martin agreed to sign the contract only when he had heard an audition from the band. This took place on 6 June 1962, produced by Ron Richards with engineer Norman Smith. Martin was not present at the session, but did meet the band and listened to the recordings. While he thought the band's original songs below par, he was impressed by their wit: when he asked them if there was anything they didn't like, George Harrison replied, "I don't like your tie". From then on the session was filled with jokes, which warmed Martin towards them. Unhappy with Ringo's drumming, Martin made them re-record Love Me Do a week later with session drummer Andy White. When it reached number 17 in the charts, Martin brought them back into the studio to record a follow-up. Please Please Me was recorded in November 1962. At the end of the session, he addressed the band from the control room, telling them: "Gentlemen, you have just made your first number one record." Not true. If you watch Anthology, both Starr and Martin agree that Martin had booked Andy White to replace Pete Best, because Martin didn’t like Best. Ringo actually showed up to play on Love Me Do, but Martin had already booked White. Martin said “I don’t even know who you are” to Ringo. He said he was burned once (with Best). He was going to use Andy White. Ringo played on the second recording of Love Me Do. This is all spelled out clearly if you watch Anthology when Best was replaced by Starr. Pete Best played during the first EMI session on 6 June 1962; Ringo played on 4 September; Andy White on 11 September. George Martin booked White because he didn’t want to take any more chances with the song (as you quote, “I don’t even know who you are”), as the 4 September version – featuring Ringo – wasn’t satisfactory. As for Anthology, Ringo says Andy White was pre-booked because of Pete Best, while Paul McCartney says George Martin didn’t like Ringo’s drumming (“to George he was not as pinpoint as a session guy would be”). Either way it seems clear that Martin was unhappy with Ringo’s drumming, otherwise he’d have used him on the third Love Me Do session. George Martin didn’t even produce the 11 September session featuring Andy White; Ron Richards did. Martin only arrived towards the end, when they were recording an early version of Please Please Me. Has anyone read Martin’s book “All you need is ears”? Wow! The book reeks of cynicism and negativity aimed at everyone — but Paul. Most glaring are his harsh critiques of George (seems to have changed his tune for the Scorsese film). For example, he waves off “Something,” one of the greatest most beautiful songs ever written, as `so simple, really…’ Simple? Hardly. A masterpiece? Definitely. “Something” is a masterpiece largely because of Martin’s arrangement. I first saw this song in a book of 100 easy listening classics before I ever heard the record and could not possibly imagine how you could arrange it to make it sound any good. When I first heard the record I was stunned by the genius of the arrangement. Yes, George Martin’s arrangement did add to the beauty of Something. However, if you listen to any version stripped of the orchestra that accompanies it on Abbey Road, it’s still a beautiful and stunning song. Listen to the Something version on Anthology 3. It’s already powerful enough with George simply singing and playing the guitar. If you still don’t believe me, listen to the earlier takes, such as takes 27 (you can find them on youtube). If that still doesn’t do it, listen to his version on George Harrison’s Live In Japan album. The coy introduction, the organ. It’s still an immaculate song without the arrangement. I don’t disagree that Martin’s arrangement was fantastic; it was beautiful, and complimented the song perfectly. However, I feel as though Harrison deserves the credit for making “Something” and masterpiece, not Martin. Just food for thought! I’m so glad that George Martin let young Harrison help conduct the arrangement when it came time for recording it. Exactly!! This is a George Harrison song from beginning to end. What song has George Martin written that compares? That’s that same crap argument Lennon used. You know what the answer is? Listen to the albums. If you hear strings, brass, or woodwinds, there’s a good chance it’s ‘his’ music. Martin was integral to the Beatles, both as a composer and guide. They would not be the band we all love without him. If you want a dumb argument in his favor, compare the albums Martin had a hand in with the one he didn’t. But helps to keep it stood and still. Oh, and to show it off. Is there any film of George Martin playing piano on any Beatles tracks? Especially on some of the rockers? Not that I’m denying it’s him: I just think it might be amusing, and illuminating, to see him playing 12-bar rock ‘n roll! Just curious! Who played the piano ad lib for Good day sunshine. It is Paul or George Martin??? Who played piano on Lady Madonna? George Martin lucked out by being The Beatles producer, and he’s turned it into a life-long career. Before them, what was he doing? The bottom of the barrel stuff like comedy records. Was he instrumental in getting them to realize their sound in the studio? Yeah. That doesn’t mean that he has the right to milk it out for the last 40 years. What a mean spirited comment. Yes, he lucked out by meeting The Beatles, in the same way The Beatles lucked out by meeting him. It was a fantastic turn of events which resulted in some amazing music, which may not have happened if they’d never met. You seem to think he did little or nothing before or since working with The Beatles, which seems rather ignorant. And why doesn’t he have the right to speak about his many achievements in the 1960s? If I’d produced Revolver and Abbey Road I’d probably never stop going on about it. I did come off pretty harsh there, and I didn’t voice my opinion very well. I do see the ying/yang aspect of it, they did feed off of each other, at least up until about the White Album. I had just been reading some things where he was critical of them, and at times I get tired of hearing him go on and on about them, and it feels like he’s trying to make a quick buck. Again, I should’ve taken the time to be a little more tactful with my comment. George Martin used his talent to perfect that of the Beatles. Without him, they probably would have been successful, but not nearly as quickly nor as largely as they are in this life. George Martin emphasized their stronger skills and assisted their weaker ones with his arrangements and deserves to milk their success as part of his own. This is the sole purpose of editors, arrangers and/or mentors; to fine tune the raw talents of their students and turn them into masters of their craft. The Beatles were very lucky that they met Martin, and not a standard pop producer of the time who would have, as a music expert put it “ruined them.” Consider Mickey Most and the Stones: all he was interested in was singles, but the Beatles basically created album rock; all Most helped produce were the singles, whereas Martin was absolutely necessary to the excellence of the product that marks all Beatles stuff (except Let it Be, thanks Phil! ); and all Most cared about was the tune which he liked the best at the time; Martin similarly wanted the Beatles to record How Do You Do It, by a professional songwriter, thereby perpetuating the old songwriter/producer stranglehold on music creation. The Beatles blew all that up, but only because Martin was willing to let them try. The comedy records to which you refer were by legends such as the Goons, Peter Sellers, Beyond the Fringe, and Flanders and Swann. Many of the records were hits. What barrel was this at the bottom of? Ye well said Joe, George Martin did some incredible things with some of the beatles records. And like you say too, The Beatles might have never been successful if Martin had turned them down as well! I guess this is Justin Bieber speaking, being jealous about the fantastic achievements George Martin had with the Beatles (and other acts). He did as much for them as they did for him. He turned their rough act into something broadly accessable – while allowing them to keep their edges. He guided their overwhelming imagination and playfulness into productive and disciplined work – while allowing them to be creative and explore something new every day. He provided them with the best musicians and technicians available – and they gave him their best. He always trusted them and supported their risky moves, and they never let him down, they always delivered. Sooo good to see people being engaged in discussion about the fab 4! They were all four very different personalities, a fact this little anecdode illustrates. Years after the split, when peole were starting to talk of/demand a reunion, Ringo was interviewed on US TV. Asked his opinion on a future reunion, he replied: “Nah, I don’t ever foresee that possibility. As it is we have all the audience of the world. John’s got all the intellectuals, George’s got all the mystics, Paul’s got the teenagers and I’ve got all the mums.” 🙂 YEAH, right! Tell me how I can contact George Martin as I am returning for another visit to Montserrat and have high hopes he’ll agree to rebuild the studio he once had there, or at least assist in promoting this idea to someone serious (reads as Clapton who is/was involved and owns a beautiful housing complex in Antigua). If you’d been to M’serrat you’d know the people there deserve it. Even George Martin admits he was not especially impressed with the initial sounds he heard coming from the band…………..but he heard something different that started to hook his interest..a relaxation of the then musical rules… and Paul and John just knew how to make it work…..every time. Thank god lightning struck twice/three times in Liverpool and once more in London with Mr Martin. there are some people commenting on here who have very little knowledge of GM or the Beatles. Suggest you watch the recently broadcast BBC documentary about George Martin to understand how much he rated the Beatles as a whole, and what he had done previously and has done since. George martin and brian epstein pretty much created the beatles/ they had their formative period but in 1962 they were molded and became a marketable franchise til their breakup in 69, some tend to disregard that martin and epstein were the brains of the operation and mccartney was the composer that provided the material. Let us know what you have been smoking! In 1962 the recording session for Love me do- Ps i love you- and please please me George martin after hearing recording from Pete Best wasnt very happy- so ringo recorded those songs and was still unhappy, in an interview with hunter davies he brought in andy white because he had a proven tract record as a session drummer and George worked well with session musicians in the past. in the interview andy whites version where better sounding then the versions by Pete and Ringo. The Ringo version was released on the british charts in 1963 went to #17. George Martin didnt like this because he believed love me do should of been a #1- Andy whites version was released in 1964 world wide was a #1. I belive the beatles changed the music world and as Paul stated thank god george martin was there for us we didnt like the decision to bring in Andy but it worked out in the end. Love Me Do was not a 1964 world wide #1. For instance, it peaked at #4 in the U.K.
George Martin didn’t think that Love Me Do would go high on the charts. So the fact that it went to number 17 in NME was a positive surprise to him. Ringo quoted that he was very upset bringing in Andy white and to this day he still call George Martin a Bugger and has had very little conversation with george since the break up. After the Decca rejection Brian Epstein visited the HMV record shop (London) to meet the General Manager Robert Boast . Brian had met Robert in Germany. It was suggested to Brian that he have the tape transcribed to 78 Acetate. Facility being available at the HMV shop. Brian accepted. During this process the technician, Jim Foy, recommended to Brian that he meet with Sid Coleman –General Manager of Ardmore and Beechwood (music publishers) who were part of the EMI organisation. A & B were located in the same building .Brian agreed. Coleman was interested in publishing Lennon and McCartney songs. He had heard 3 on the acetates. 13 Feb. George Martins diary featured an item ‘meeting Bernard Epstein’. Meeting took place- meeting finished –George did not commit. George took no further action. 1) According to Kim Bennett (salesman with A & B ) ‘Sid Coleman approached Len G. Wood (Managing Director of EMI) and tried to persuade Len to offer the Beatles a contract. Len in turn asked his producers available that day . All rejected the Beatles .Possibly George Martin was not available that day. Sid had taken ‘Like Dreamers Do’ with him. It is possible that Sid pushed a bit harder and got the date in George Martin’s diary. 2) Kim Bennett heard ‘Like Dreamers Do’ and liked it very much. Kim wanted to record ‘Like Dreamers do’ by private arrangement-cheap deal where A &B would pay the cost of the recording session. Idea rejected by Len Wood-‘you stick to publishing –we will stick to recording ’replied Len. The exact detail of how the 13th Feb. meeting was arranged may never be fully known. Unlikely that Sid approached George Martin directly. Sid’s regular contact was with Len Wood, and according to Kim Bennett Sid and George did not get on. Martin had signed a new personal contract with E M I however, he, George Martin, was not happy . Martin wanted a royalty . Len G Wood said no! 23 -25 April George gave a presentation at the Norbreck Hydo-large hotel in Blackpool-North West England. George took with him the Parlophone secretary ( her name was Judy and the lover of George). Subsequently L.G. Wood found out and was livid. At a regular meeting between Sid Coleman and Len G Wood it was decided to give the Beatles a contract. 2 To register the disdain from Len Wood to George Martin for the Blackpool incident. i.e. the reason for the Beatles contract had nothing to do with the talent of the Beatles.. The main motives being the acquisition of publishing rights on the ‘Like Dreamers do’ song and/or office politics. 9th May . Brain met with George Martin Wednesday 11.30-The commercial detail pertaining to the Beatles being given a standard 4 year contract, was discussed. Letter sent to Brian . 6th June recording date set. I have read all the replys regarding George Martin’s contribution to the Beatles, I have analyzed each song from the beginning Albums with my “The Complete Beatles Piano/Vocal Books”. As a music theory project I found song after song Martin had taught an element of beginning Music Theory. McCartney has too much knowledge for what he has done. Lennon, grasped the concept of the 12 Bar and was satisfied to pen his wit and political stand for words. George, enjoyed building his technical performance. Ringo finally found the pocket! I have no interest in the money nor he said/she said but I personally feel George Martin was an excellent instructor and guidance through that time they were exposed to one another. Does anyone know if George Martin smoked pot or took LSD with the Beatles? I really don’t think he did. He knew very little about their pot-smoking. It was a shock for him to learn that they even tried LSD. George Martin didn´t always understand Lennon´s music. Martin brought up in the 1930s, and wanted the pop music to sound like Irwing Berlin´s songs. Martin couldn´t realize that Lennon had at least two kind of melody types: one with an outer mobility, and one with an inner mobility. In the outer mobility melody type the melody goes up and down in the scale, and uses several notes. In the inner mobility melody type, the melody consists of only one note, but the background changes instead., for example in Julia. –Martin preferred Love Me Do instead of Ask Me Why (The Mammut Book of the Beatles, Sean Egan, 2009). –Martin didn´t like Tomorrow Never Knows, when he heard it the first time (The Beatles, Bob Spitz, 2005, pg 601). –Martin didn´t like All You Need Is Love when he heard it the first time (the book above, pg 700). –Martin didn´t like I Am The Walrus when he heard it the first time (Here There and Everywhere, Geoff Emerick, 2006, pg 213). Martin was were more close to McCartney, than to Lennon (the book above pg 7). –1964 there was an LP record released by Martin called Off The Beatles Track, with Martin´s instrumentations. In I Want to Hold Your Hand, Martin completely missed the point: he didn´t put in the octave run in “…I want to hold your HAND!!!…”. The same mistake in Please Please Me: he didn´t put in the octave run in “…it so hard to reason with YOU!! !…”, the most important bits in these two songs. He wanted them to sound more commercial. The octave runs are too expressive. I have listened to it. Once again I can hear that George Martin didn´t understand Lennon´s music. He does Help in staccato!! Horrible, despite typical for Lennon is that he had long notes. And you cannot hear anything from the background in the song either,another typical feature with Lennon is just using the same notes, but instead let the background change. But nothing of this here. And in Lennon´s Ticket To Ride George Martin has completely missed the point. “… is going away…” must be in a dissonce chord! !The most important bit in the song. But nothing here. And in this song Lennon for the first time has long parts with only one chord, and a bourdon note, that give you that suggestive feeling. But nothing here. Martin tried to do Lennon´s music as pop music from the 1930s. Martin always praised McCartney, because McCartney´s music resembles the music from 1930s. Martin even treated Lennon unfair. Up to 1966 Lennon had composed most of the hits in The Beatles. Despite that George Martin said in the summer 1966, that McCartney composed almost all music in The Beatles. George Martin contributed to the Beatles split. I have never encountered Martin’s claim that McCartney “composed almost all the music in the Beatles.” Do you think you could provide a source for that segment of the interview? No, Johan can’t provide sources or quotes; he never does because they don’t exist. His wildly fantastic, highly-biased, and unsupportable claims are scattered throughout these blogs. I will give him credit, however. Some of said comments do provide a hearty laugh! I talked with members in a pop music band in the summer of 1966. They had talked with George Martin soon before. Martin said it. Many many times George Martin (wrongly) said that Lennon was more interested in words than in music. George Martin gave Lennon a wrong image. The Beatles break through was Please Please Me 1963 with a melody with a new expressionistic tension, far away from 1930s. We all know today that it is a completely Lennon composition. George Martin irritated Lennon with statements that it is a joint composition by John and Paul. See the book Lennon Letters. Thank you for the information. I will have to investigate further before I form my own conclusion. Who was this band you interviewed in 1966 and what was their affiliation with George Martin? I knew somebody who claimed they knew somebody………. No, it´s OK! You see, Beatles, or Lennon´s music, is a life passion for me. I have a habit of reading or buying all books about The Beatles, and I am shocked over how enormously much credit McCartney has got during decades of music he hasn´t composed! It´s scandalous. How could this happen? The Beatles is music history, and history must be written in a correct way! There is a need of a scientific resinvestigation about this wrong history. In 1969 Lennon was very depressed: ” Most people thinks it was all Paul or George Martin”. (According to Allen Klein in Goldman´s book from 1988). In that book for the first time it is written that Paul “wants to give the impression that he´s done it all by himself”. But McCartney condemned the book, so the establishment and the public, didn´t discovered the criticism of him. Lennon said 1970, that the filming of Let it Be “was one of the main reasons The Beatles ended”. The film “was set up by Paul for Paul”. “He wanted to show that he was The Beatles”. But nobody cared. The esatblishment adored McCartney. For them the reason to the split was Yoko Ono and Allen Klein. Very well written. You can have an opposite point of view without being impolite, or arrogant. That is not so common. My respect. What an interesting series of comments, criticisms and expert opinions (Not). Collectively they have little to do with George Martin but speak volumes about their individual authors’ egos and fascination with trivia. All in all,”Much ado about nothing” Get a Life. That was rude. Yes, people have gotten a little off topic sometimes here whenever they have disagreed about the Beatles. That you believe they may have gone a little too far in this case is noted. That doesn’t necessarily give you any right to tell them what to do with their individual lives. I’m surprised that Joe allowed your comment to be posted given its lack of civility in regard to what he usually expects for this site. The comments on this page have indeed gone way off topic. Let’s not have arguments, and let’s all stick to discussing George Martin. Deal? Simply put, All members, AND staff, played their parts. Sir George Martin did, in fact, arrive to The Beatles, with quite a qualified resume. He was successful BEFORE and AFTER The Beatles. As talented as The Beatles proved to be, I truly believe that, had George Martin not crossed paths with the group, they would have seen little, if ANY success. Likewise with Brian Epstein. The Beatles had gone from a leather-clad “Bar Band” to a group of poised professionals-thanks to Mr. Epstein’s guidance. His keen (and shrewd) business sense propelled the into a world marketplace that they couldn’t possibly have mustered, on their own-a marketplace they, perhaps, didn’t realize was out there. The Beatles ushered in the Stadium rock concert era…thanks to Brian Epstein. Imagine a 23 year old Paul, sitting on a chair, finger-picking YESTERDAY on his acoustic, with strings to accompany him. 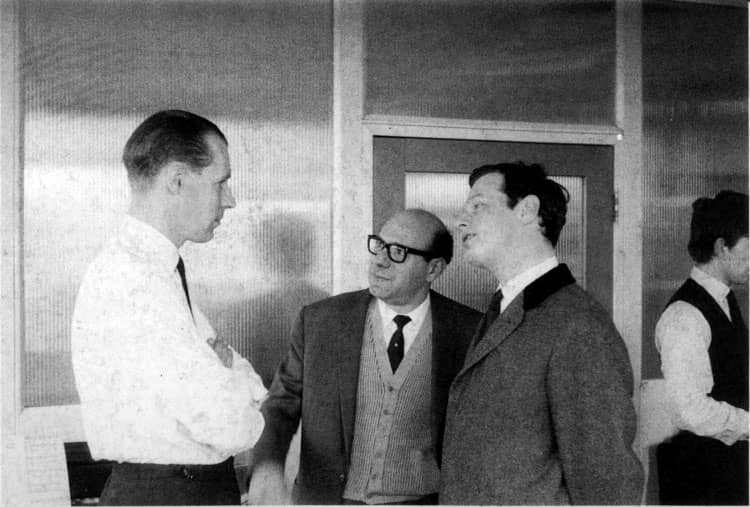 That was George Martin’s arrangement…and Brian Epstein who secured their bookings on large-scale, live TV, for the world to take it in…and THAT just scratches the surface for the contributions by Brian Epstein and Sir George Martin. That George Martin missed the octave leap — the most important bit in the song – in his instrumental version of Please Please Me in the record “Off The Beatle Track” from 1964, reminds me about this: Pierre Boulez railed against conductors “who tried to make “Pelleas et Melisande” by Debussy, boring with discretion worthy footman, interpretation in which many contrasts in the work were reduced to a minute scale and robbed of their potency and violence.”. The conductors could not in the beginning interpret Debussy correct, as George Martin couldn´t interpret Lennon. It has been confirmed that George Martin passed away just yesterday at the age of 90. He will be greatly missed. Ringo Starr and Sean Lennon have already given their public condolences. rest in peace. A great man who left us with his musical magic that will last forever. That change started the Beatles’ ascent to the stratosphere. I do think George was more simpatico with Paul, but that was more a matter of temperament and personality compatibility than any musical prejudice on George’s part. He had great respect for Lennon’s talent. How else do you account for his awesome contributions to “In My Life ,” ” Tomorrow Never Knows,” “I Am The Walrus,” and “Because”? Very well said. With far more insight (and succinctness) than Johan has ever shown. I’m very surprised by this banter between Johan and Richard. Are either of you musicians? I’m not here to toot my own horn but I have a pretty good grasp of music theory. Both John and Paul’s compositions were simply brilliant. Period. And George Martin was instrumental in making this great music accessible to the masses. That’s it! It’s not THAT complicated. I’ve read direct quotes from G.M. stating that both John and Paul were brilliant composers. Nothing I’ve heard him say sounds like he favored one over the other. He appreciated their brilliance and was surprised by their “blooming like plants in a hothouse”. He said they were very quick learners in the field of successful songwriting. And on many occasions, especially praised Lennon as having a “great voice”. One that could send “shivers down the spine”. George Martin indicates that he had no deeper understanding for music. In an interview 1982 George Martin said: “…John was inclined to leave things to us and do his rock n roll bits …while the music side was basically Paul…” How dared George Martin express himself in that way? It´s scandalous… “his rock n roll bits” ! Or George Martin must have been by some reason hostile to Lennon. Today it´s obvious that Lennon is one of the greatest c o m p o s e r ever. The man who composed The Beatles first hit the innovative Please Please Me, who composed the fantastic middle part in This Boy, who composed the lovely and sad melody in Girl, who composed the mighty anselm-like All You Need Is Love, the man who composed the cosmic Across The Universe, who composed the madrigal-like Because and who composed the wonderful oldfashioned Good Night. Are these compositions “rock n roll bits”?? George Martin damaged Lennon´s reputation, and self confidence, and contributed to the split of The Beatles. Never mind that I don’t exactly agree with your basic opinion on George Martin (much less the rest of your writing here) but if you’re determined to be taken more seriously here, it would really help if you would not only cite your sources but show definitive proof as to their validity and legitimacy. That would include your claim about you talking to members of a pop band in 1966 about Martin, which I asked you about almost two years ago, and you still have not given an answer for. Johan never does cite / support any of his claims. I am quite convinced he posts here simply to troll. George martin MADE the beatles:; sure they were a cover band in 62 but martin gave them the production that made them presentable, without him they would have never made it to the US, never been the “sensation” they get regarded as & never made it all the way till 1969 like they did, but they NEVER surpassed Brian Wilson.